This is a short but fun run from Idledale to Morrison. The run is in a rocky creekbed with unrelenting gradient. Though the rapids are continuous with few eddies, it offers a great introduction to creeking with relatively easy moves and tame consequences compared to solid class V runs, but has enough action to keep even the most seasoned class V creekboaters entertained. Scout No Fun Falls from the obvious pull-out on river left half way up the run to help decide whether or not the run is to your liking. Carnage on this run is frequent during brief intervals when it has sufficient flow. The shuttle and river access are trivial, making multiple laps a breeze. 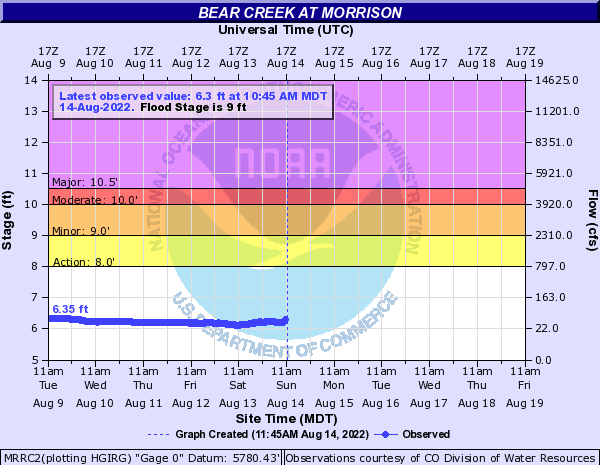 In the great flood on September 2013, Bear Creek spiked to levels estimated to be 1000-1500 cfs. People ran it at 750 cfs and perhaps higher. Although the flows induced swims from several good boaters, overall the the flow was still manageable, but recovery becomes difficult. At flows above 400 cfs, the crux is getting through sticky holes at No Fun Falls, and a large hydraulic after the botton slide. The high flows rearranged some rocks and brush, but the main features are still more or less the same. Put-in at the road in the town of Idledale next to the bridge. Be conscious of respecting the homes in this area and park your car out of the way. As you exit the main drag in Morrison heading west, turn left at the light (Hwy 8) followed by a quick right onto Bear Creek Ave., just before the bridge. Follow signs to Morrison City Park and park near the bridge. Also known as No Scout Falls or the Bridge Drop. Shortly after the put-in, a horizon line with a bridge appears. This is private land so stay in your boat. The landowner tends to greet visitors with a rifle. Boof the right side of the 5 foot ledge with left angle. Move left down the remainder of the short rapid. After the 2013 flood, a large cottonwood was down across the main line. This will be difficult to remove given the private land issues. There is still a reasonable line at almost all flows down the center channel and a boney sneak line down the far left channel. A small slide appears shortly after the Splitter Rock rapid. It is usually run on the right side to avoid the hydraulic and wall, but the left slide likely goes at most flows. This is the signature rapid on the run and is an easy scout from an obvious pullout on the road. Retaining walls signal the start of this rapid. Punch several ledge holes (some spots of the holes are weaker than others) and boof the 8 foot falls at the bottom. If you're unsure of yourself, safety at the bottom of the falls is a good idea because this run isn't pool drop. A significant horizon line signals the second distinctive slide on the run. It is typically run on the right side or left of center, depending on the flow. Shortly after the bottom slide, are two back to back holes. At normal flows this feature is fairly uneventful, but at > 400 cfs, the first hole forms a sticky hydraulic. Our group had a 33% failure rate at 450 cfs. Boof the dam or piton! It's better at higher flows. An easy portage is available on river left. A distinct river left cliff wall on the horizon signals the start of this rapid. Punch a hole at the top, duck under some willows and boof a ledge on river left and follow the flow back to the right. Below the dam the river steepens again and winds back and forth with very few eddies. Go with the flow and duck any overhanging branches.